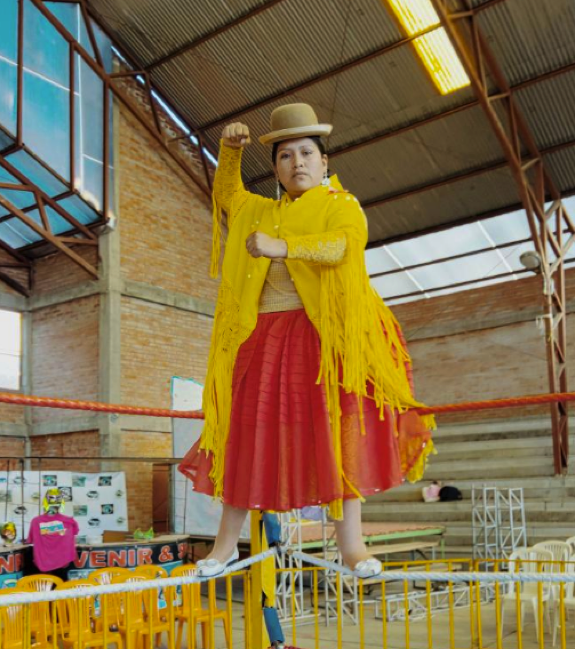 Bolivia's stylish Flying Cholitas have merged modern wrestling with their community's history of activism. 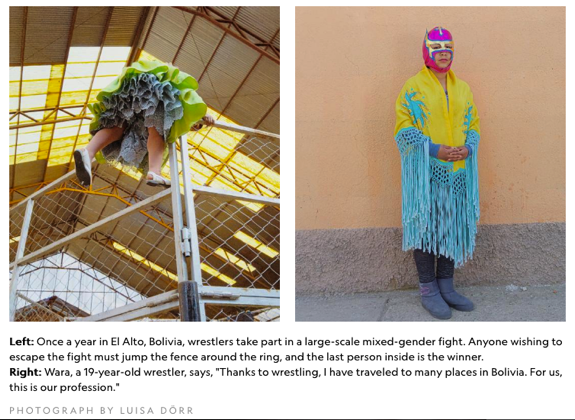 "People need heroes, wrestlers, champions of their own who can be admired," reflects Brazilian photographer Luisa Dörr, who spent ten days in El Alto, Bolivia, with a unique group of female wrestlers known as the Flying Cholitas. Recognizable by their colorful and elegant attire of multilayered skirts, embroidered shawls, and precarious bowler hats, cholitas emerged at the turn of the millennium—an expression of the indigenous renaissance taking hold in the Americas. 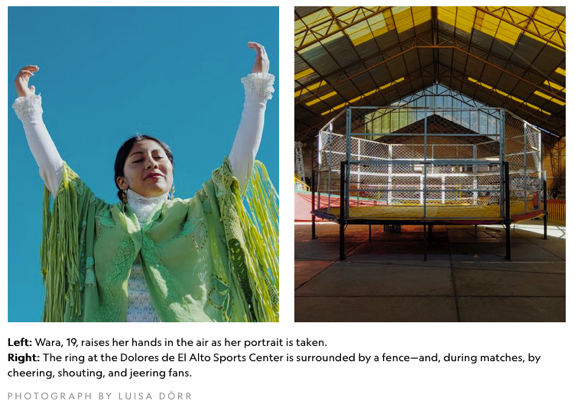 Dörr, who likens them to Hollywood superheroes capable of flying, first encountered the wrestlers while her husband was working with local architect Freddy Mamani. She recalls attending Sunday matches at the community's multifunctional center: "It's been a long time since I stopped liking the men's fights. They're the same as ever, but the Cholitas are the ones that save the show. The younger audience members identify with the good heroines, while the older ones prefer the rougher ones," she says. The Cholitas train twice a week and watch YouTube videos of Lucha Mexicana to improve their techniques and tricks. "The fight, more than anything, is a constant update of maneuvers. It's like riding a bicycle; if you learn to walk, you never forget. But if you want do tricks, you need to practice. The fight is the same. An eternal learning," explains Claudina, whose father, brother, and sister also wrestle. And the better they get, the more they can assert their presence in a field dominated by men. At times, both genders are even pinned against one another. "When a woman fights 100 percent, men want to fight 1,000 percent. They do not accept that they are overcome. In our companions, there are also some anti-Cholas," says Mary Llanos Saenz, known as Juanita La Cariñosa in the ring, who's been fighting for almost 20 years. "In the beginning, we were not allowed to enter the men's room. We used to change in the stands and wait outside. That's why we created the Association of Fighting Cholitas. There, men do not get involved." Monica, a friend and social worker in the community, was Dörr's way in. 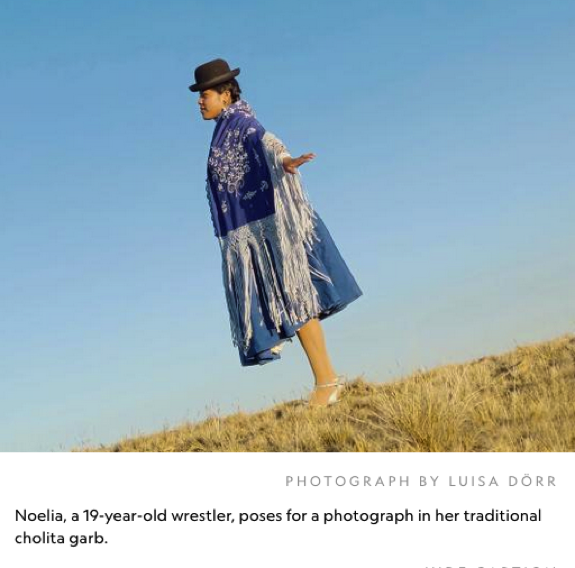 "[The Cholitas] don't really care about journalists and fancy magazines," Dörr remarks. "Many of them were not interested with wasting time with a photographer on a story they will not ever read." Their attitude toward media is at least partly fueled by the fact that the cholitas have much more urgent concerns than becoming famous. For centuries, they've also been fighting outside the ring to protect the well-being of their community. 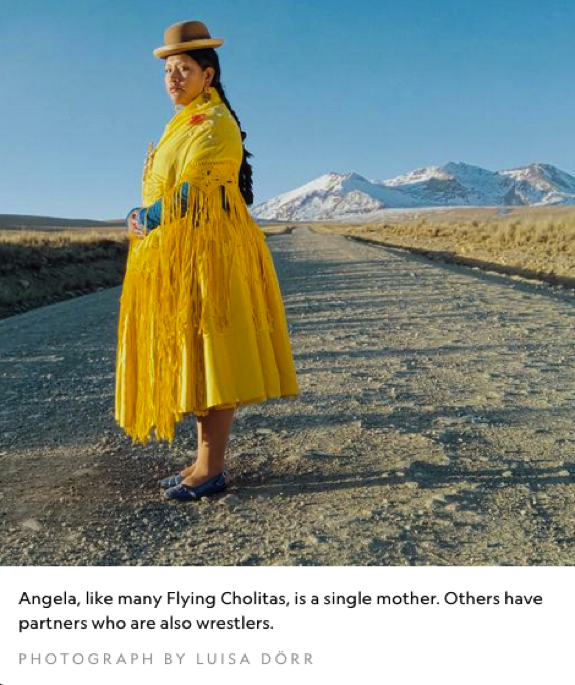 Most cholita wrestlers are Aymara, an indigenous nation residing in the high plains of South America. The group has faced ethnic oppression and exploitation since the Spanish colonization of the region. Referred to pejoratively as "cholo" or "chola" at the time, they were forced to perform menial tasks for aristocrats; required to adopt European customs; refused entry to restaurants, public transportation, and certain wealthy neighborhoods; and denied the opportunity to vote, own land, and learn to read. Resilient, the community organized, leading several successful movements over many decades, the latest of which was the ousting of President Gonzalo Sanchez de Lozada—currently facing charges for extrajudicial killings—and the election of an Aymara politician, Evo Morales, to the country's highest office. In the process, they've reclaimed the once-pejorative name and style of dress, turning both into symbols of pride. 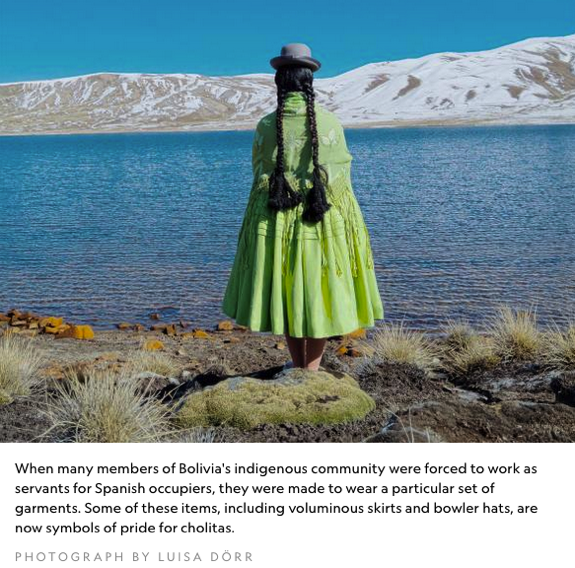 "When El Alto gets angry with the state, because they have neglected their schools, their health centers, or their markets, or because of the absence of security in the neighborhoods, it is the women who go out and demonstrate," explains Dörr. 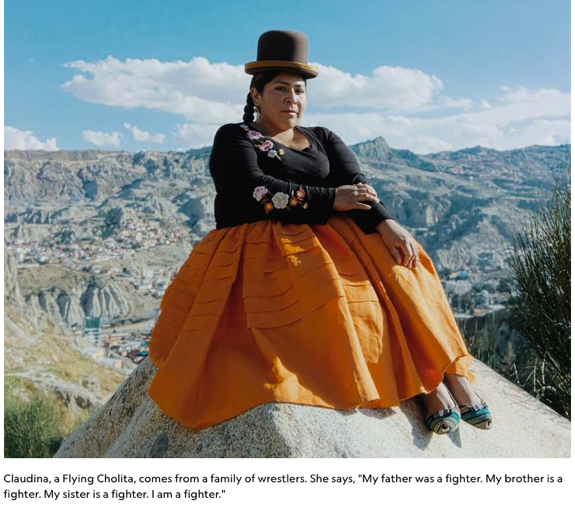 "And therein lies the essence, the reason why people enjoy watching and admiring the Cholitas fight, because it is the dramatization of the Chola Aymara woman from El Alto." 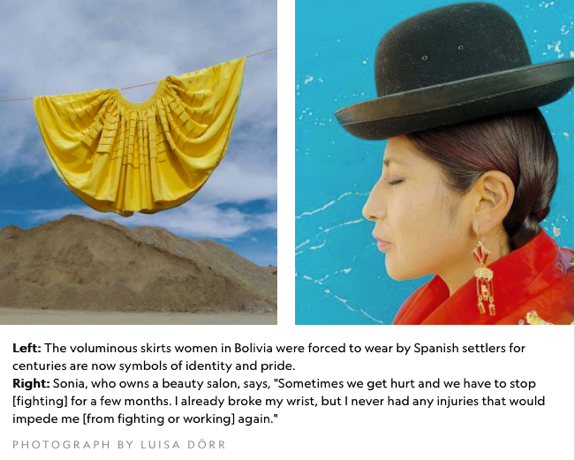 Luisa Dörr is a Brazilian photographer based in Bahia, Brazil. See more of her work on her website or on Instagram.